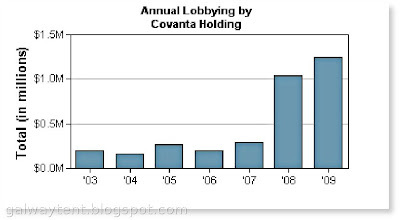 The Galway Tent Blog: Covanta Huge Increase in "Lobbying"
Big Increase in Covanta Money for "Lobbyists". 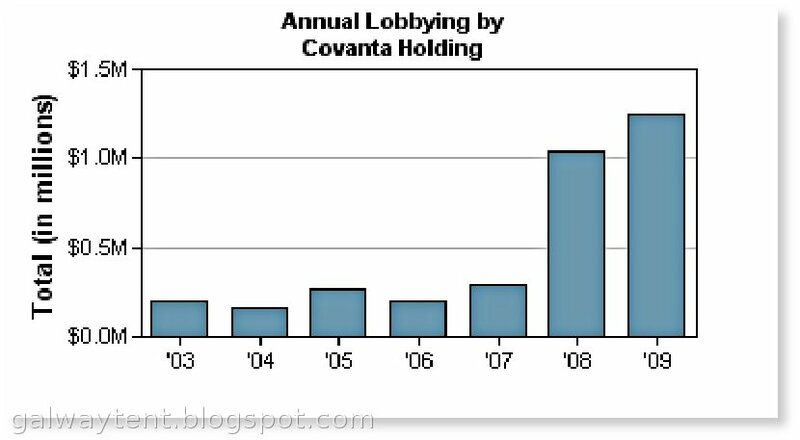 Covanta has greatly increased its reported lobbying budget with USA lawyers. Dublin's incinerator promoters have used a lawyer with apparent US interests - including running a fundraiser in Dublin for the US presidential elections. Covanta's purchases of influence in Brussels, London and Dublin is not reported. NOTE: All lobbying expenditures on this page come from the US Senate Office of Public Records. Data for the most recent year was downloaded on February 01, 2010. All information concerning lobbying expenditures in Ireland are the private property of the galway tent cartel.